The Sea of the West at its highest expression. 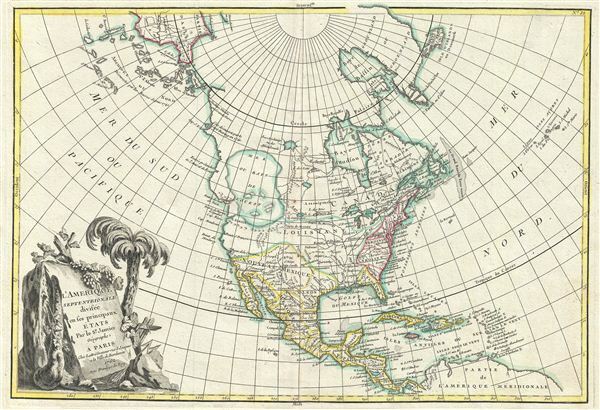 An altogether fascinating map of North America by Jean Janvier dating to 1862. Covers the continent from Panama to the Arctic Circle, extends westward to include parts of Asia and eastward as far as Iceland. This map is heavily influenced by the theoretical mappings of Guillaume de l'Isle and Philippe Buache. Javier divides the continent according to the three colonial powers that controlled it, with england controlling the colonies along the east coast, France occupying Canada and Louisiana, and Spain dominating Mexico, Florida, Cuba and Central America. By far the most interesting aspects of this map deal with Janvier's treatment of the largely unexplored Pacific Northwest. A magnificent sea called the Sea of the West or in this case the 'Baye de L'Ouest,' occupies the greater part of the northwestern part of the continent. This body of water, alternatively called the Sea of the West or Mer de l'Ouest, was speculated by Philippe Buache and Guillaume De l'Isle in the early 18th century based upon wishful thinking, American Indian stories, and the somewhat questionable 16th century explorations of Juan de Fuca. Janvier gives the Mer de l'Ouest its fullest expression, though he specifically does not connect it to either the network of lakes and rivers extending westward form the Hudson Bay or to the similar network extending westward from Lake Superior. These river and lake networks were being actively explored throughout the early 18th century by a number of little known but important French explorers. Most specifically the explorations of Verendrye with regard to the discovery of the Lake of the Woods (L. Des Bois) and Lake Winnipeg (L. Ouinipigon), both of which appear on this map. even farther to the north we find the a series of straits narrowly separating American from Asia. The extreme northeast tip of Asia is itself fairly well mapped giving evidence to the explorations of Vitus Bering and Tschirikow. Slightly to the south of Asia the cartography is slightly less certain with regard to questionable islands in the north Pacific. These most likely stems from Tschirikow's sightings of the Aleutian Islands and the assumption that they may have been joined. The lower left hand quadrant is dominated by a large decorative title cartouche depicting some of the flora of the continent. Drawn by Jean Janvier in 1762 for issue as plate no. 32 in Jean Lattre's 1783 issue of the Atlas Moderne. Rumsey 2612.070 (1782 edition). Phillips (Atlases) 629-33. Wagner, H. R., The Cartography of the Northwest Coast of America to the Year 1800, 559. Wheat, C. I., Mapping of the Transmississippi West, 1540 - 1861, 192. Sellers, J. R. and Van Ee, P. M., Maps and Charts of North America and the West Indies 1570-1789, 93.